Aure du Communn is a souvenir shop which was started in July 2007 located in the heart of the old town in the city of Bayeux. The shop is stacked with books loaded with information based on the rich Norman history, the specialties and highlights of the area and more. The boutique house exquisite lace work, embroidery, appealing poetry, a more that serve as ideals gifts for special occasions. The shop also sells some of the best produce of Bayeux which includes jams, cider, calvados, etc. After visiting this place you are sure to take home a piece of your memorable trip forever. For extra information on anything, the shop gives you internet access which is not so common in the city of Bayeux. How popular is Aure Du Commun? People normally club together Gold Beach Museum and Bayeux Tapestry Museum while planning their visit to Aure Du Commun. Qualitative souvenir store (toys, books, paintings ...), owners very friendly, real jet plane inside, a must to see ! The lady was very friendly and happily helped when I asked. 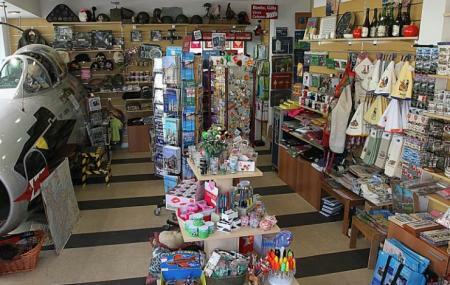 The store itself is a nice place to visit and has many good gifts for tourists. Super magasin de souvenir, a voir absolument.